Put Marseille in your pocket with Trippa Marseille. Enjoy a stylish little stay in France's second largest city and experience the joie de vivre that Marseille's 30,000 years of history have blessed it with. 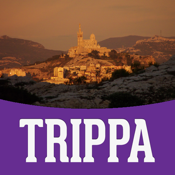 Trippa Marseille puts the city's best bars, restaurants and shopping on your iPhone. Carefully and lovingly curated by our experts. Packed full of information, Trippa Marseille is the only app you'll need for a stylish little stay in Marseille. ✔ No in-app purchases; Everything is included in your download. All of Marseille in one place. ✔ Been there, done that; We've eaten, drank, shopped and partied in every venue. We'll share the wheat, omit the chaff. ✔ All the information; Why would you not want to know about the sights you're seeing? Just enough of the right facts and figures on Marseille's main tourist attractions. ✔ Getting around; How much is the taxi from the airport? Which bus do I need? We'll let you know. ✔ A gourmet experience; Ever the gluttons, discover Marseille's best restaurants with us.